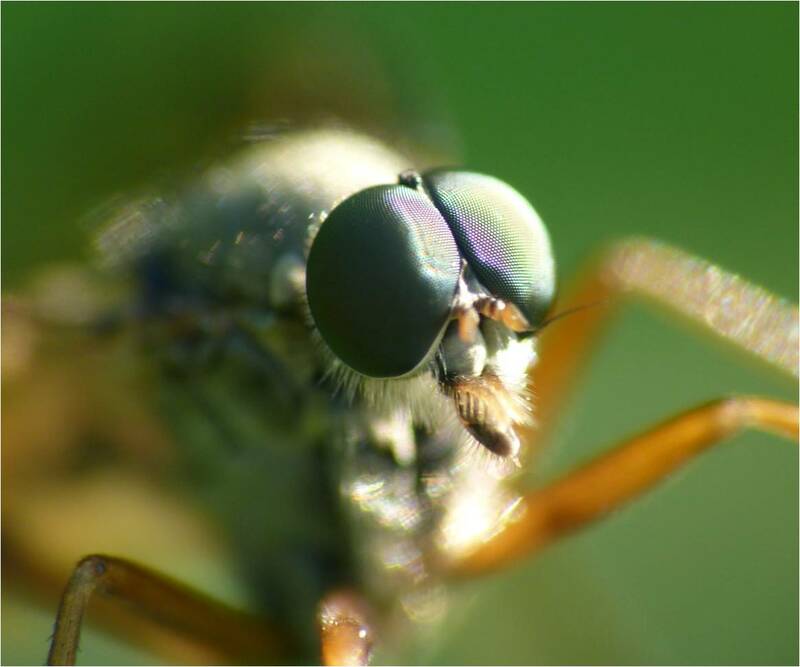 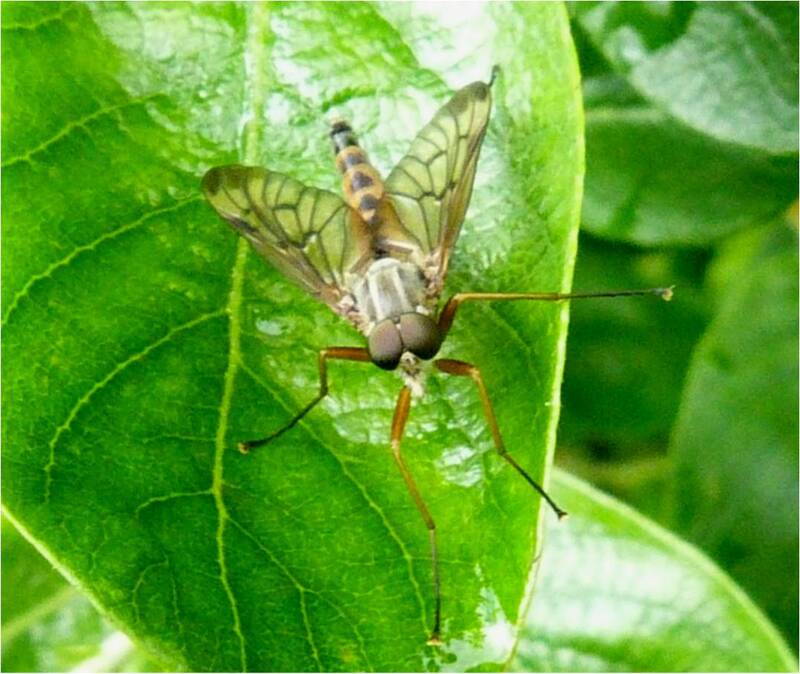 Although the snipe fly in some of these photographs are looking upwards , this fly is in fact known as the ‘downward-looking fly’ because it likes to rest on vertical surfaces such as walls, posts and tree trunks with its head pointing downwards. In fact, I have finally managed to get a photograph of the snipe fly resting on a wooden post looking downwards as it's supposed to - yippee! They fly in quick, darting motions.The abdomen has black/brown and yellow bands and the wings are transparent with darker spots. Similar to the snipe fly above, but noticeably smaller. 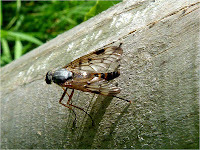 In addition, this species has an all grey thorax rather than a striped one and the wings only have one dark pterostigma (black mark) on each wing which is otherwise clear, unlike the species above which has a greater number of dark markings. Both species have the yellow and black bands on the abdomen with the female (as here on the top and middle) having a broader abdomen than the male (sorry about the blurred photos) at the bottom. 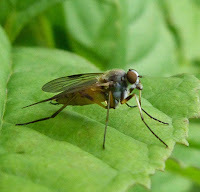 Quite a delicate and attractive looking fly. 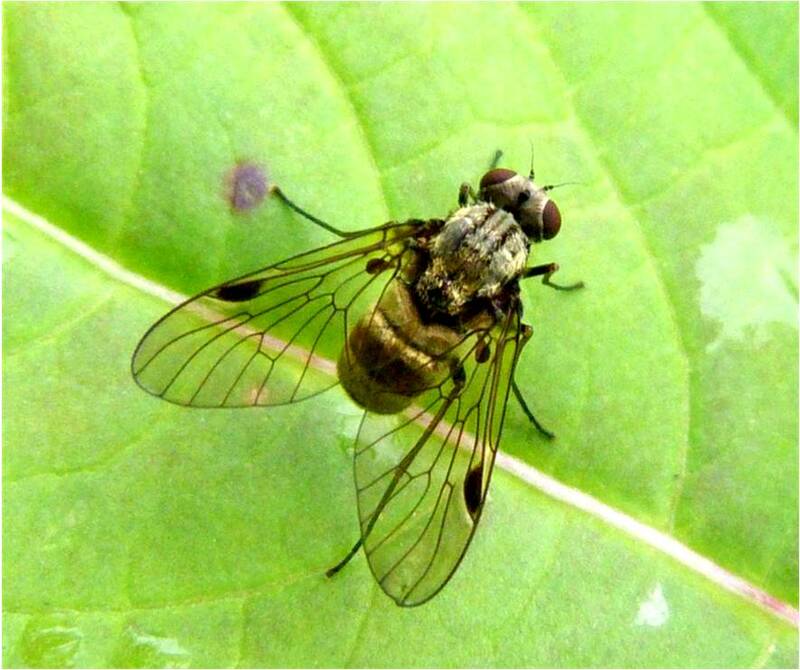 There’s something really beautiful about the female of this fly (the top photos), with its brown tinted wings with dark spots, its creamy broad abdomen and hairy striped thorax. Its eyes are also broadly spaced and circled with a white ring. 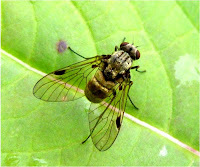 The male (in the middle photos) has a slimmer, darker abdomen and its eyes, like many males, meet in the middle. 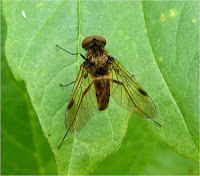 The male also has a dark patch on each wing. 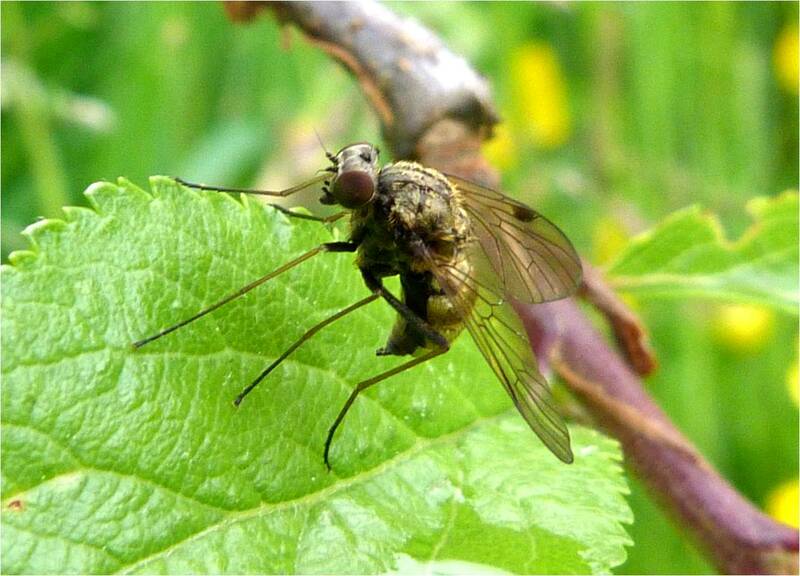 The abdomen of both males and female curve sharply towards the ground as you can see from these photos. 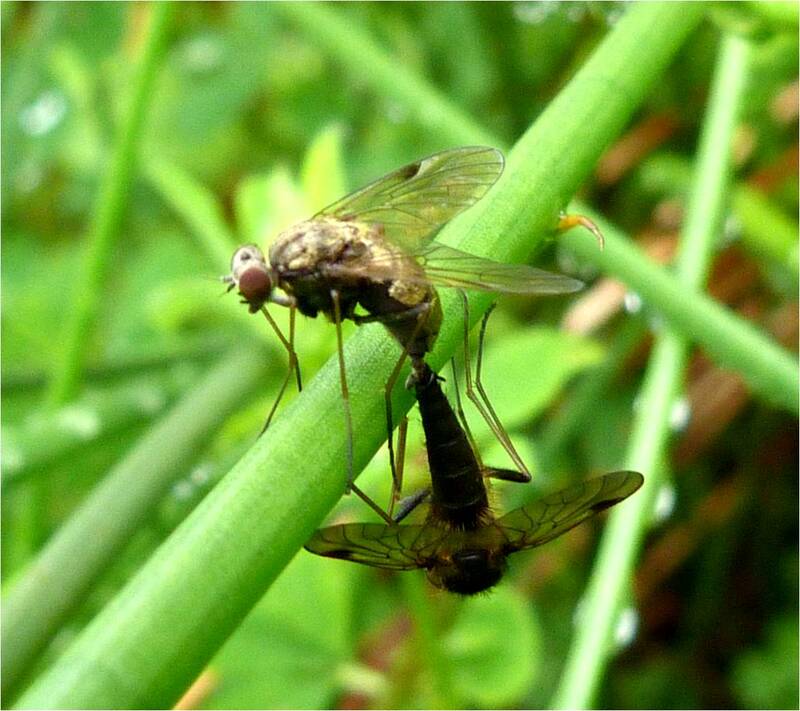 The snipe flies mating in the bottom photo look pretty precarious - not sure even the Kama Sutra will have this position in it - although I like the fact that it's the male who's been made to dangle over the edge! 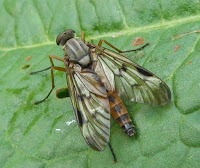 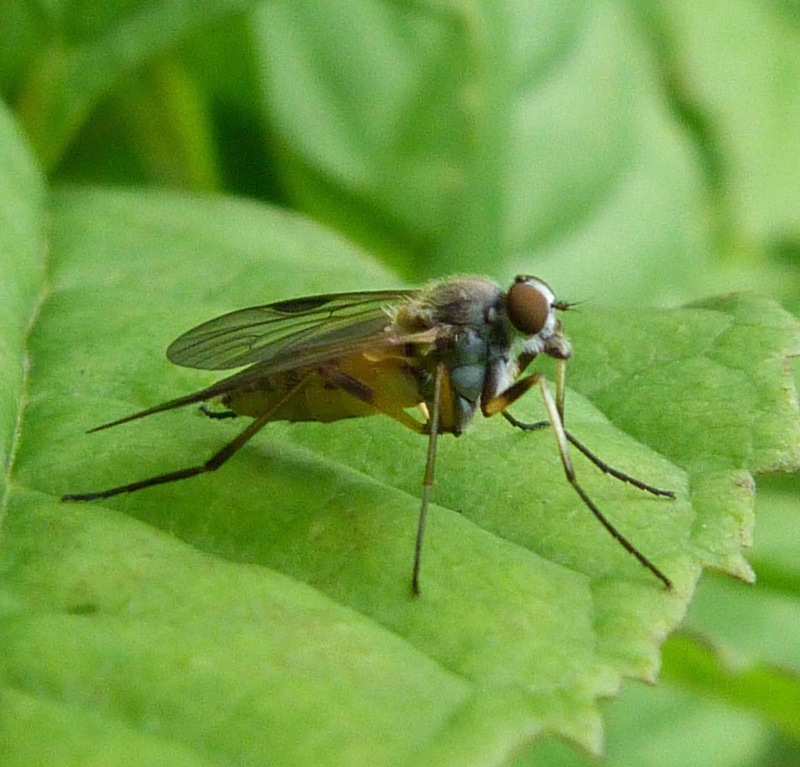 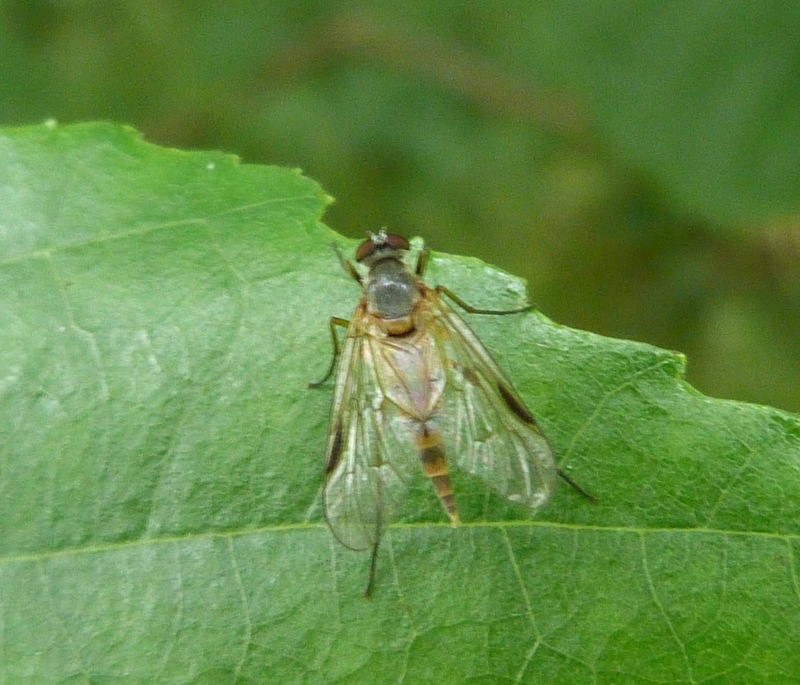 The one 'distinguishing' feature about this snipe fly is that is has no wing 'stigma' (i.e. no dark marking on its wings) like most other snipe flies (see above). 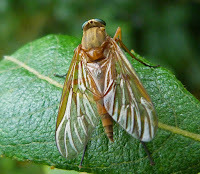 It has an orange abdomen with dark triangles or diamond shapes down its 'back' which unfortunately you can't see terribly clearly here as the light is reflecting off its wings. 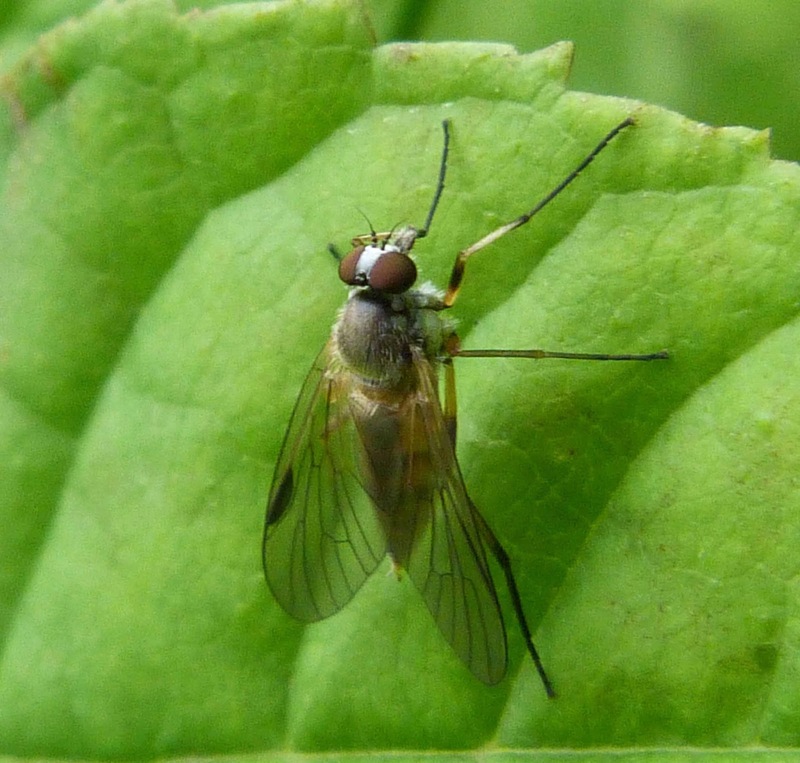 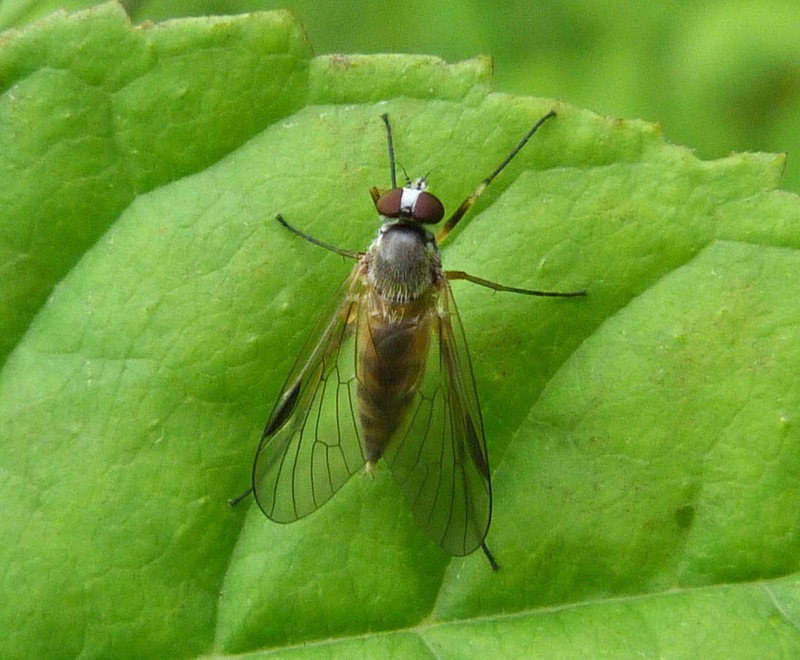 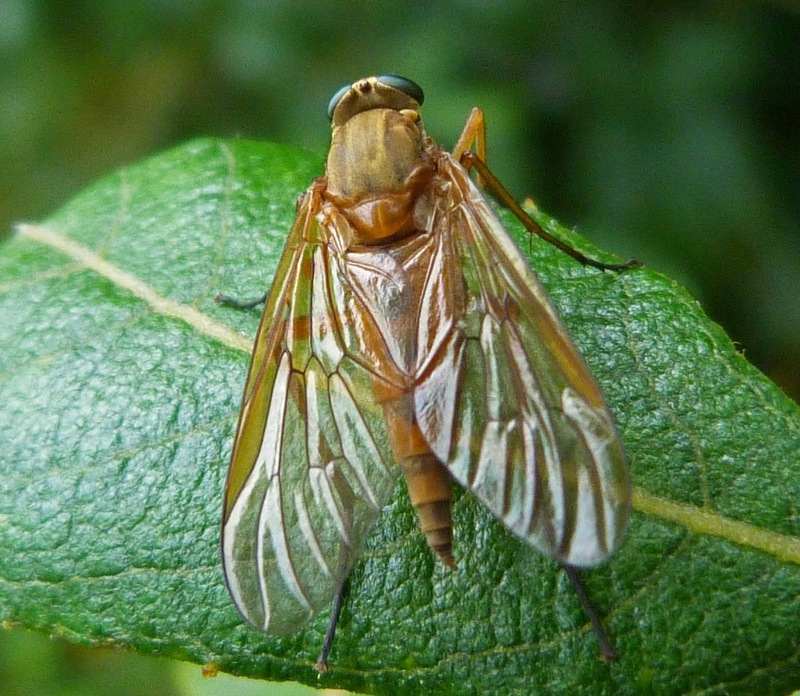 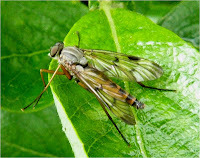 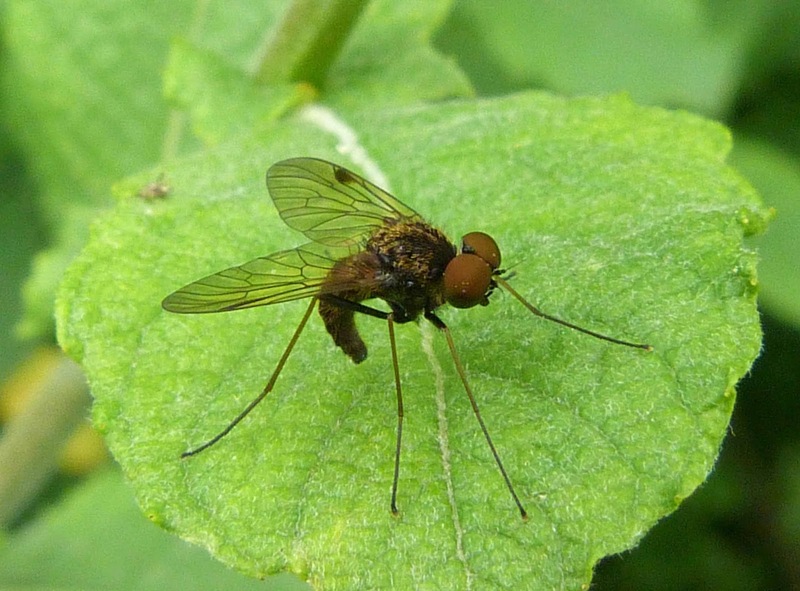 It is a large snipe fly and is common throughout the UK, although less widespread in Scotland. 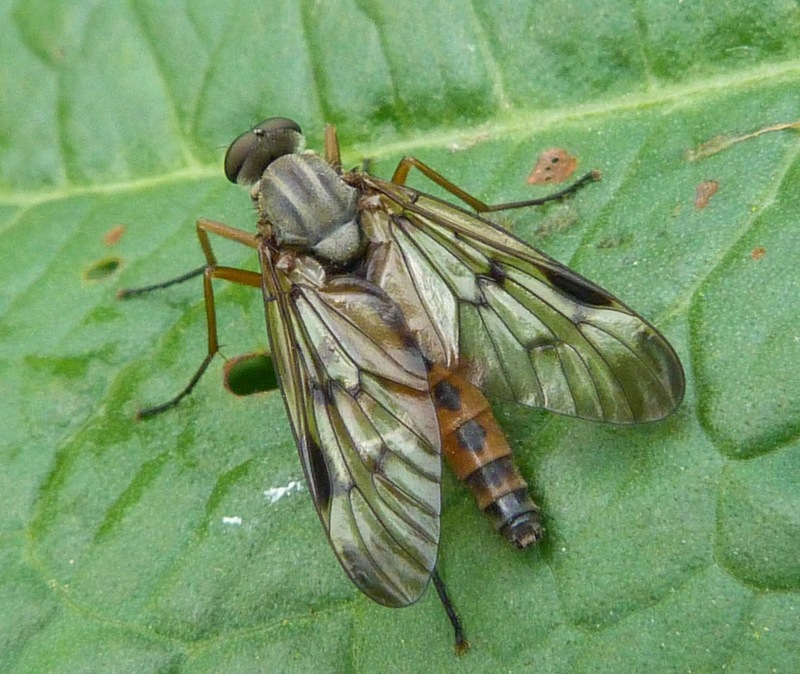 Unlike the other snipe flies, it also appears to have green eyes rather than brown, but that may just be the way the light was shining on them.